I am sad you are no longer my tiny baby. I am sad I did not fully appreciate those fleeting first few months. I am sad I could not be as patient with you then as I am now. I am sad I will never have this experience again, with you or any baby, my first born child. I am sad our pregnancy ended early. I am sad I did not get as much time wishing, hoping, thinking and planning about you and your arrival as I would have liked. I am sad when I see largely pregnant women out and about, shopping for baby clothes, unencumbered by another child, because I know they are in the dream-filled state of not yet being a parent, something I did not get the time in which to relish. I am sad when I see these women because I imagine they are more than thirty-two weeks pregnant; a state of being I never got to experience with you, my first baby. I am sad you had a tough start to your life. But I am so proud of how strong you are. Awww V, this is truly one of the only times in my life where i can say I know how you feel. If there's anyone who can relate, it's me. And you express your thoughts and feelings so eloquently it makes me all teary. The important thing really is that he's healthy and very happy and you are a WONDERFUL mom to boot! You're so awesome, #7. You're making me all teary right now. Love you! Love you, miss you. I'll have to make it over soon. Quinn (my first) was 4 months old when I went through this same thing. Especially seeing pregnant women out and about - chid free - but so excited. Just wait. I cried at his 2nd birthday - not the first - the 2nd! And he'll soon be turning three. By the way - thanks for the award! Very sweet post. I don't know if warriors are supposed to get teary eyed, but this Warrior did. Love you sweetie! What a wonderful post. I got choked up when I read it. I hope you print it and put it in his baby book. That is just so sweet. I envy your sentimentality because I really don't miss being pregnant at all. I agree with Alex - make sure he sees this one some day. Can I have my extra credit now? Yes! He needs to see this one day. My boy will be two in a month. I have a 4 month old. I regret not wanting to have more kids. I regret not enjoying my kids' babyhood. oh my gosh...looking at this picture is like looking at a picture of my son Logan when he was newborn. 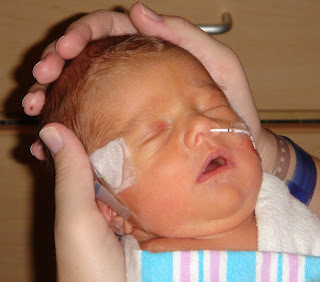 he was born at 34.5 weeks, and had to have a feeding tube as well. he has GERD, so the first 7 months of his life were a living hell. i feel robbed of the rest of my pregnancy, and the fun newborn months, since they were so stressful. especially since he was our second and last child...i wanted so much to enjoy my last pregnancy....i know exactly how you feel! Please be nice. Moderation is ON.